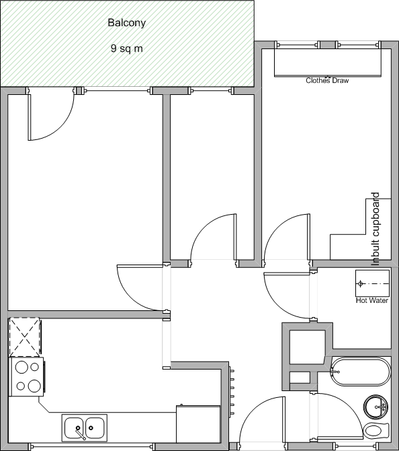 This is the floor plan I knocked up from the measurements the surveyor gave me. Its not 100% accurate as the walls don’t line up without fudging. What missing from this plan is the stud wall in the living room (the big room the left) The previous owner had stuffed in four bedrooms into this place. To cut down costs they removed the heating and hot water that the building provides, and replaced it with second rate storage heaters. Bastards. On the plus side they might have left the pipes in place, making the cable laying much easier.